Are you sure Prishti Pre School is closed down? 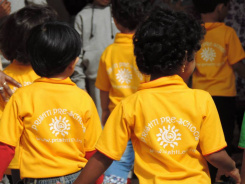 The Prishti Pre School located in Whitefield, Bangalore East, Bangalore, Karnataka, India follows the teaching methodologies of Playway, Montessori,Montessori Playschools, Playway Playschools. The Prishti Pre School curriculum is planned appropriately for the age span of the children and is implemented with attention to each child individual needs, interests, and level of development. This will make your child’s initial year of schooling a positive experience in a warm and caring environment where children can learn individually and begin to work within a group. Learning Differences Flute, Guitar, Keyboard, Dance Classes are available. Sand pits and Pool is also there. One of the best schools in Whitefield, Bangalore! The faculty and the infrastructure is really good. I would recommend this school to everyone! The best preschool in Whitefield and are very good. The teachers are very caring and supportive. This is one of the best pre-schools. The teachers are really caring and practical. I loved the way they teach the students. Kids learn everything very easily. Loved it. I'd gone to more than 20 schools in and around for my little angel, some way or another I was not satisfied. I'd to compromise off one or the other which I didn’t prefer. Being my last move, I’d gone by this school. I was really stunned by seeing the infrastructure, cleanliness, the expert method for taking care of kids. In the wake of identifying with school staff I’d chosen that is the correct spot for my little one. My little girl is simply heading off to this school throughout the previous 5 months, she loves to go to class at 2.2 years old. I discover the school exceeds expectations itself in everything.